I’ll Show You, Blue Kangaroo! Lily and Blue Kangaroo are inseparable, as close friends are. Lily though is not listening to what she is being told. She keeps doing things she has been told not to, saying to Blue Kangaroo ‘I’ll show you’. Because she keeps refusing to do the right thing something happens to Blue Kangaroo. Will Lily be able to find Blue Kangaroo? Will she stop being naughty for long enough to actually get him back? This is a story about listening and doing what you are told, it shows that there are consequences to your actions. 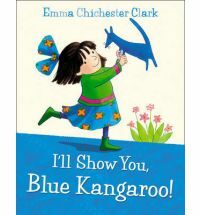 Lily is an excitable girl who loves to show off and Blue Kangaroo is her loyal companion whom she nearly loses because she refuses to listen. A good story to illustrate these concepts if you feel inclined. The bright and friendly illustrations contribute a warmth to this story.